Standard - €42.99 Only 9 left! Ever been watching TV or a movie and you see a guy just slide across the screen with a jacket that shimmers like gold in the sun, a microphone held in his hand, spreading joy and fun? 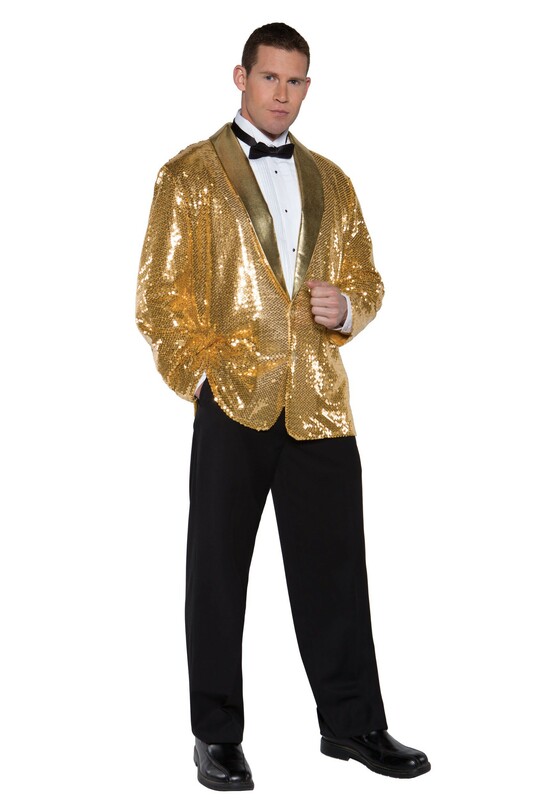 Guys like the crooning Elvis, energetic James Brown, spirited Michael Jackson, and the funky Bruno Mars, all have donned the flashy sequined jacket. They made being flashy cool. So, why not try your hand at being a little bit funky? Get ready to show off your vocalizing and dancing when you wear this Gold Sequin Jacket! Be sure to practice a little before the big night, the electric slide always looks way easier than it actually is. Believe us! You'll be sure to be the top billed performer for the night, whether you are crooning the audience on stage or busting a move at a costume party!